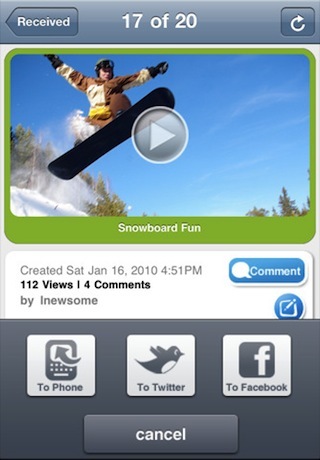 Thwapr is a new video sharing app for the iPhone that lets you shoot, upload, and share videos right from your iPhone. What’s so exciting about that you ask? 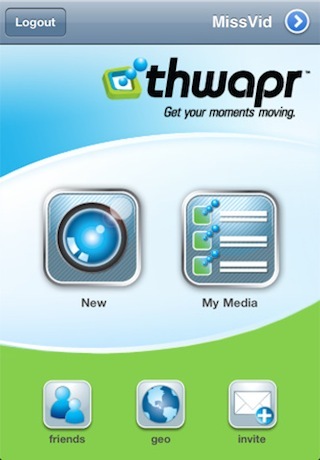 The Thwapr app lets you upload long videos (as long as 30 minutes) to its servers and share them with your friends. Once you open the app, you have to register your phone number for a new account. As soon as you log in you will get an SMS text message from “Miss Twapr” who is apparently like the “Tom” at Thwapr. The message contains a link to a bit.ly URL that is titled, “Welcome to Thwapr” so let’s see what it contains. The link takes you to a website (thwapr.mobi) that has a broken image right on top, along with a message about how awesome Thwapr is. If you scroll down you’ll find a button called Play. Tap that and voila, a short intro video starts playing. The video plays right in your browser, not in the app. So lets go back to the app itself. You have buttons for “New” and “My Media”, as well as “Friends” “geo”, and “Invite”. You can upload videos already on your iPhone or shoot new ones. Once you shoot a new video it gets compressed and you can name and describe it before it gets uploaded to Thwapr. Thwapr also pulls up your iPhone’s Address Book and asks you to pick some friends to share the video with. This must be part of the “Terms” that you have to agree with when you sign up. From My Media you’ll find your uploaded files. Tap a video, wait like 5 seconds and it will take you to the next page where you have to tap it again, wait another 5 seconds and it will start playing. The uploaded video quality is not great, but not horrible either. The social aspect of the app is a great idea. People can comment on your media, and you can have friends who all can see your uploads, although you can make stuff public as well. There is a web interface for Thwapr which you could also use. Overall, I have to say the app is a great idea, but it doesn’t work very well now. The UI needs work and the they need to make it work faster. If you can put up with sluggish performance, its worth signing up and trying it out, as an alternate way to share iPhone videos on the go. For now I’m sticking with YouTube and Facebook for video uploads. AppSafari review of Thwapr was written by Joe Seifi on February 7th, 2011 and categorized under App Store, Files, Free, Video. Page viewed 5939 times, 2 so far today. Need help on using these apps? Please read the Help Page. FYI – I just downloaded the Thwapr app and tried sending a video I took from my son’s birthday party. It was too long to send from my iPhone and it worked really well. I did not have the sluggish experience you mention. Your issue could have been ATT’s issue – as they usually are. First of all thanks for having a look at Thwapr. It turns out AppSafari found a bug for new user registrations – which we really appreciate. There should be no SMS messages sent to an iPhone app user as our app delivers only push notifications to iPhone app users. After reading this app review, we diagnosed the issue and fixed it quickly. At this time, no iPhone app user will receive the SMS message mentioned in this review. So that is one enhancement readers should know about. As far as video sharing experiences, the other commenter here is on target as our app generally works quite well to share video on 3G and WiFi. Maybe AppSafari can take another look at a later date. regardless thanks for catching the bug and its fixed now.